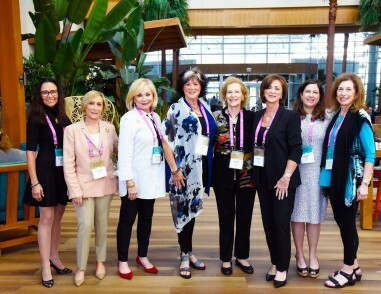 Women's Philanthropy provides a place for all women to come together to promote, enhance and celebrate Jewish life. We are committed to building a Jewish community that is welcoming, engaging and demonstrates the impact a woman makes by having her voice heard. Click here for the Lion of Judah Brochure. 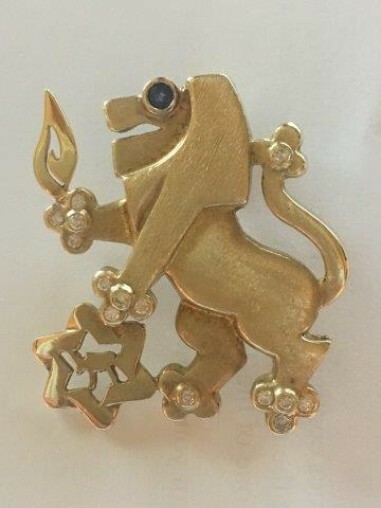 The Lion of Judah is a symbol of today’s Jewish Woman’s strength, a symbol of her caring about the organized Jewish world and a symbol of her commitment to Jewish peoplehood. 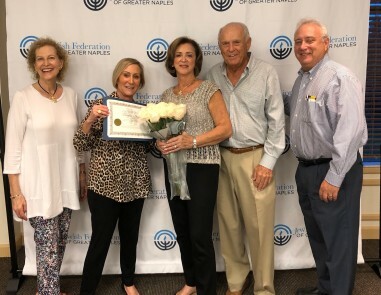 Each year that a woman sustains or increases her gift of $5,000 or more to the Jewish Federation of Greater Naples' Annual Campaign, she is eligible to have a small diamond set into her pin. Larger commitments are recognized at different Lion of Judah levels, as signified by different precious stones. 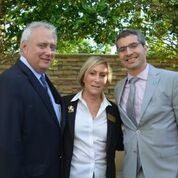 Today, more than 16,000 women world-wide proudly wear the gold Lion pin to signify their commitment. The Lions of Judah gather during the year for inspirational, educational and fundraising events. 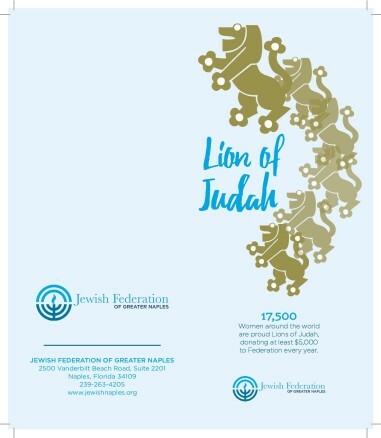 Created in 1972 in Miami, the Lion of Judah program has brought together women of all ages and from many walks of life in order to play an essential role in creating social justice, healing the sick, feeding the hungry, preserving human dignity and building Jewish identity. Read about:The International Lion of Judah Conference. Click here. At our October 9th Board meeting we presented Rosalee Bogo, this year’s Kipnis-Wilson/Friedland Award winner, with her certificate. The Kipnis-Wilson/Friedland Award honors extraordinary women who have set a high standard for philanthropy and volunteerism. Rosalee will also be recognized for this award at the International Lion of Judah Conference in January 2019. 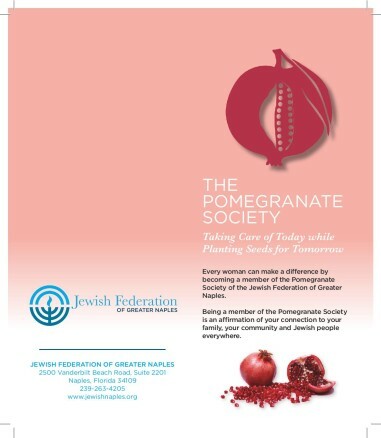 A minimum gift of $1,800 in your own name to the Jewish Federation of Greater Naples’ Annual Campaign earns your place as a member of the Pomegranate Society. When you give a gift in your own name, you will be joining the long line of women who have carried on the fundamental Jewish tradition of tzedakah. 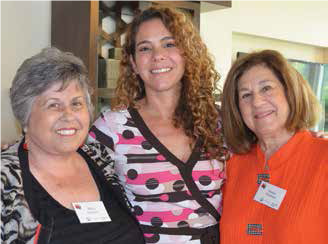 You will inspire other women to translate their Jewish caring into giving that makes a difference. The Pomegranate Society represents the best of what Federation does, bringing together like-minded women to do a world of good – promoting, supporting, enhancing and celebrating Jewish life. Women who reach the Pomegranate Level are entitled to wear the specially designed Pomegranate Pin, introduced in 1981 by the Jewish Federation of Lehigh Valley. Each year that a woman continues her gift at the Pomegranate level, she is entitled to add a new ruby “seed” to the pin indicating the number of years she has contributed as a Pomegranate. 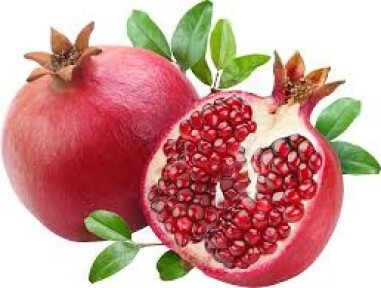 The pomegranate was chosen as a symbol of this level of giving as it contains 613 seeds, symbolizing the 613 mitzvot, or commandments, within the Torah. More than a beautiful piece of jewelry, the Pomegranate pin is a symbol of a woman’s commitment to and compassion for the Jewish people. A proven inspirational tool, a woman’s pin shines a little brighter each time she increases her pledge. Each step up brings her closer to becoming a Lion of Judah and motivates her to stay with Federation and complete that journey. Today, more than 7,000 women across North America proudly wear the Pomegranate Pin, signifying their personal commitment to and passion for their communities and their Jewish families around the world. Click here for the Pomegranate Brochure. at Clive Daniel Home with Beverly Gray. 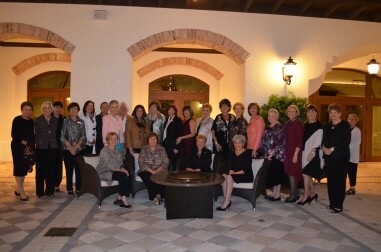 celebration of the impact of women’s philanthropy. See firsthand the impact of gifts are having on people’s lives. With the creation of our Pomegranate Society, 132 Federations now have a Pomegranate Society, and there are approximately 7,750 members nationwide. 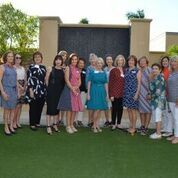 The Pomegranate Society represents a new level of giving for women’s philanthropy in our community. In order to be eligible to become a member of the Pomegranate Society, a woman needs to make an annual minimum contribution of $1,800 to the Federation’s Annual Campaign. 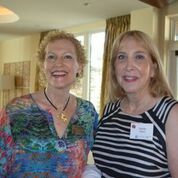 Pomegranate Chair Betty Schwartz and Pomegranate Associate Chair Susan Pittelman spearheaded the effort to create a Pomegranate Society. The program was inspiring and provided the Founding Members with new insights about the work of our Federation. Jane Schiff, Board Chair, relayed the story of how and why she became involved in Federation. Jeffrey Feld, President/CEO, spoke about the impact that the Annual Campaign can have on people’s lives. The women heard firsthand about the effect that their campaign dollars have had. Alicia Browner, whose sons received scholarships to attend a Jewish summer camp, gave a heartfelt talk explaining that the experiences her sons had at camp were instrumental in shaping their Jewish identity. Nir Buchler, the grandson of Holocaust survivors, shared his personal history, which is filled with stories of how the Jewish Agency for Israel played a key role in his own personal Jewish journey. During the afternoon, 21 Founding Members were each presented with a Pomegranate Pin. The pomegranate is an ancient Jewish symbol and the beautiful pin has now become a symbol of a woman’s commitment to the Jewish people, representing Federation’s goal of bringing women together to benefit Jewish causes. The Founding Members who were present also signed the charter that acknowledges the establishment of our Pomegranate Society. 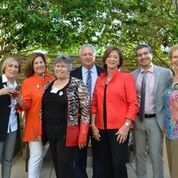 It was a lovely afternoon and a very meaningful way to honor the Founding Members and to celebrate the creation of the Pomegranate Society of the Jewish Federation of Collier County. 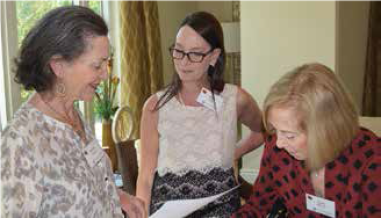 The event was warm and welcoming – and as the women got to know each other, you could feel the synergy in the room. While most Pomegranates came to the event not knowing each other, they left as friends. Julie Hartline, Campaign Associate,at 239.263.4205 or jhartline@jewishnaples.org.